Beautiful hands always make good impression. Choosing a moisturizing hand cream in the cold season that is not greasy is a challenging. I don’t know if it is because I like the number seven or it’s just a simple coincidence, but I have tested seven hand creams and I want to share with you a little bit of my experience. One of my old selections for this top is Eight Hour Cream Intensive Moisturizing Hand Treatment by Elizabeth Arden. The white tube hides an emollient hand cream to maintain skin soft for at least eight hours. It is suitable for using it before you go to bed. It has a gel consistency and you can hug your hubby without fearing that you will leave greasy stains on his pajamas. I couldn’t have forgotten to include a shea butter hand cream in this top. L’Occitane does a good job to nourish chapped hands. I recommend it for women with dry skin because it has a rich texture and is easily absorbed by skin. Jurlique Lavender Hand Cream was a gift from a friend and I must say that I enjoy its delicate scent. Basically it is made of natural ingredients and contains essential lavender oil. I consider it suitable for people that live in cold areas or that need to hash their hands very often. StriVectin - HC Ultra-Concentrate Cream For The Hands was formulated for aged hands. 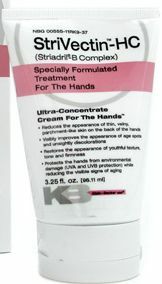 If you have parchment-like hands and you cannot find a good treatment to stop the ageing og your hands, look no further. StriVectin – HC restores skin firmness and reduces fine lines and even age spots. Suitable for women +45. 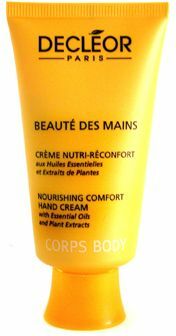 Another anti-ageing hand cream is Nourishing Comfort Hand Cream produced by Decleor. It can be used by women +30 and it prevents signs of ageing. It is also recommended for people that suffer from excessive hand perspiration. SPA Hand Silk Cream – Natura Bisse has water proof properties to ensure a long lasting hydration. I advice people that work in restaurants or like cooking to give it a try. It has a natural formula that creates a barrier to protect skin against environmental damages. Men cannot be left behind when it comes to taking care of their hands. Men Hand Cream created by Ahava contains Dead Sea ingredients and plant extracts - Gingko and Ginseng – to instantly repair dry hands. It can also be used by allergic man. Compare and research Hand Creams.